Our goal is for you to experience the Presence of the Lord. Visiting any church for the very first time can be exciting and, at times, even stressful. We want you to feel comfortable and at home. 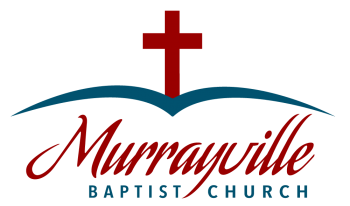 Your first visit at Murrayville Baptist Church will be refreshing and enjoyable for your whole family. Our goal is for you to experience the Presence of the Lord and have the liberty to receive the blessings that He has for you. You will find our church family to be friendly and welcoming, and available to answer any questions that you might have. Beginning with an excellent nursery, there is something special for every age. We have a safe, clean and staffed nursery for children 2 and under. For ages 3 through 18, there are Bible centered classes that are designed with each age group in mind. Also offered are classes for the Married and Seniors. There is not a dress code at Murrayville Baptist Church. Our ministry leaders and many of our members dress in the more traditional "Sunday" dress. However, our main goal is that you would feel welcome and comfortable and come as you are. If you have any questions, or need additional information, please click here to utilize our contact form or you may email or call us directly. Our pastor and staff are available to talk with you at any time.